The BBC’s weekly The Boss series profiles different business leader from around the world. This week we speak to Amanda Hesser and Merrill Stubbs, co-founders of cookery website Food52. Friends Amanda Hesser and Merrill Stubbs gambled that creating the website they wanted to use but couldn’t find could be the recipe for a business success story. In 2008 the two New Yorkers were disappointed that there wasn’t a one-stop website for food lovers that they liked, a place that contained everything from recipes to cookery videos, a cookware shop, culinary articles and travel guides. At the time if you wanted recipes you typically went to one website, says Merrill, and if you wanted kitchen equipment you went to another, and so on. So the two food writers and trained chefs decided to launch Food52. Today the business partners say their company has grown into a virtual cooks’ community of 13 million people around the world, who trade recipes, buy cooking utensils and dinnerware, watch video tutorials, and swap tips and ideas. 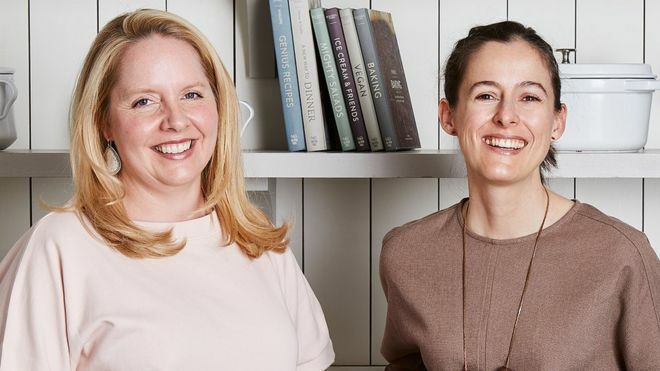 With annual revenues said to be about $30m (£23m) last year, the New York-based firm extensively uses social media and YouTube to connect with users, and also produces its own physical books. While Food52 is now a leading player in a very crowded food website field that also includes the likes of Serious Eats, Cookstr, and Chowhound, a decade ago it was a more novel concept. So much so that Amanda and Merrill initially struggled to get investors. “Nobody wanted to invest… when we launched,” says Amanda, who has the chief executive title. Instead the two friends, who were in their 30s at the time, got Food52 up and running using money they had got as a book deal advance, and by borrowing funds from Amanda’s husband and Merrill’s mother. Amanda and Merrill first met in 2004 when they worked together on a New York Times cookbook. Amanda was the food editor of the newspaper’s magazine, while Merrill was a freelance food editor and writer. It was almost a year after Food52 launched that it got its first $750,000 of external investment. As user numbers soared over the next decade, investment was easier to find. The company has now secured a total $13.3m of funding. Food52, which gets it name from the number of weeks in a year, gets almost three-quarters of its revenues from merchandise sales, and the remainder from advertising and other commercial tie-ups. After selling other brands of kitchen equipment for five years, in 2018 it started to sell its own-label products. To help design each item Food52 turned to the website’s users for inspiration, asking them what they wanted from a product. No less than 10,000 people filled out a survey about what makes a perfect wooden chopping board. Megan Hodgkiss, an Atlanta-based communications strategist who helps companies better connect with their customers, says that Food52 was ahead of its time when it launched in 2008. Yet she cautions that as the online food website marketplace is now so competitive, the firm will have to continue to work hard to hold on to its followers. “It needs to stay ahead of the curve concerning culinary trends, and its audiences’ preferred [social media] communication channels,” says Ms Hodgkiss. To help keep its social media presence as fresh as possible, Food52 has an 11-person marketing team. And its 80-plus total workforce includes many people in their 20s. But Amanda and Merrill, who both live in the New York borough of Brooklyn with their respective families, say that at the very heart of the company’s success is their enduring friendship.